The North Park Theatre is a historical single screen movie theatre in Buffalo, New York. It has functioned as a cinema since it opened in 1920. 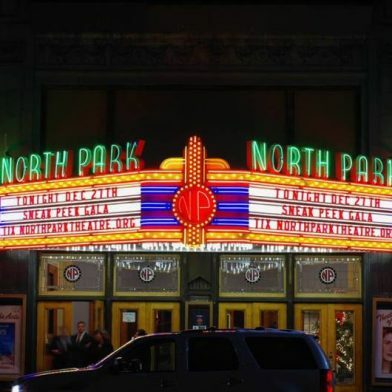 Originally called Shea’s North Park, the theatre, along with Shea’s Performing Arts Center, serves as a remnant of the now defunct Shea’s theatre chain, once owned by early twentieth century businessman Michael Shea. Its design by Henry Spann was influenced by the neoclassical movement. The auditorium features a proscenium above the screen and a 5-paneled recessed dome arched into the ceiling, both decorated with murals by Raphael Beck. Still used as a movie theater and entertainment venue today.